It doesn´t matter if you train for Mixed Martial Arts (MMA) or Self Defense, wall wrestling is one of the most important aspects of real fighting because it is the interface between stand up and groundfighting. In my new Video-Download I will teach you a simple but effective way of controlling the wall Clinch. Brazilian Jiu Jitsu is awsome. If you fight someone who has background in a Grappling Art he is basically lost on the ground and you don´t need much effort to defend him. Wouldn´t it be nice if you could apply the same BJJ groundfighting concepts in a Stand Up situation? What about pushing an attacker into a wall, positioning yourself in a smart way and using pressure and the own bodyweight to wear him down and finally tap him out? This is exactly what you will learn in my new Video-Download “Wall Wrestling” A few years ago I realized how important the clinch at the wall is. If you can control someone in this distance you can take him down much easier and with less effort than in free space. I realized that “Wall Wrestling” is a little bit like the “Half Guard”on the ground. If you are able to secure the right head position and a strong Underhook you can control your opponent in a very effective way without using much strength. From there you can use headbutts, punches and knee strikes to wear him down and finally you can take him down with a few simple takedowns because the wall take away the space he needs to sprawl or move his legs away.Even if you don´t want to strike your opponent, you can use the pressure of your bodyweight to make him tired and take him down much easier than in free space.I realized that there are not many instructionals out there that teach the basics of wall wrestling and that is why I have come up with this system. The download consists of a 75 minute long video, a booklet that will cover all basic principles and gives you a training progression and a mindmap that connects all positions from the video into a gameplan. I am not teaching you random techniques but a systematic approach of all the important moves and principles of the wall clinch. There are no “crazy” moves that require extreme athleticism but simple fundamentals everyone can apply. 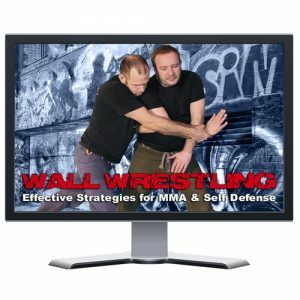 Besides the aggressive aspect of wall wrestling I will also show you how to escape the wall and how to use the wall as a weapon when you throw your opponent against it. What to do if your opponent doesn´t give you the Underhook. Escapes when you are with your back at the wall.